Just can't get enough of these fabrics. to have enough fabric of the same colors. The Kitties are paper pieced but they are appliqued down to the background fabrics. 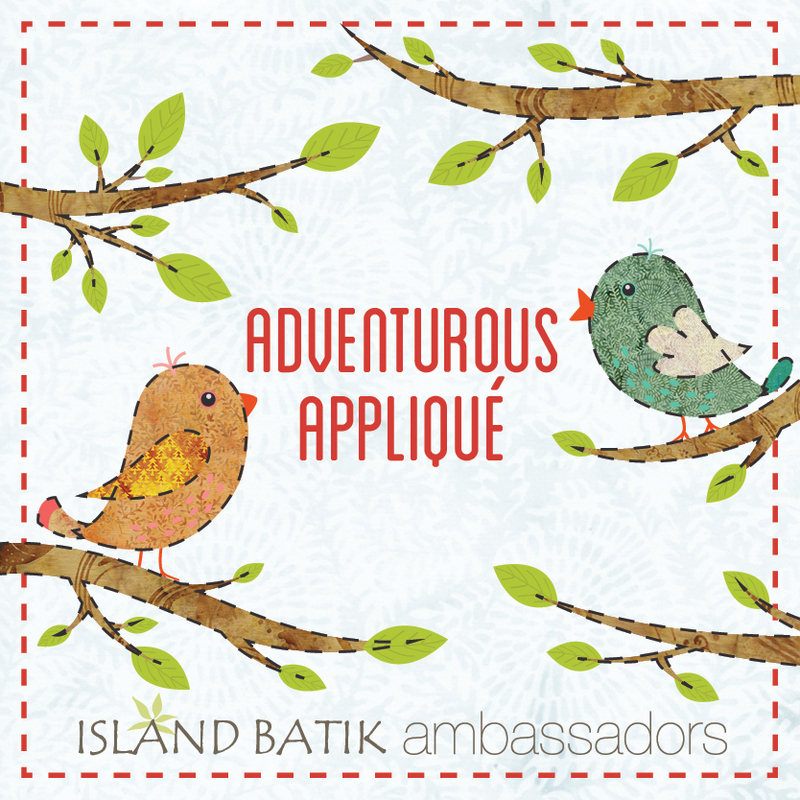 I love being an Island Batik Ambassador, not only two boxes of fabric a year but it stretches my imagination. I was not happy with the binding so as of right now, the binding is off. I just need to get with it and redo it but I do like the outcome of this quilt and hope you do too. A while back I was trying to think of something to do with the ladies at the Assisted Living (still would like some ideas). As I mentioned before, they have an auction twice a year. The auction is next week. The last auction I donated a panel quilt which went for 270 dollars (paper money they earn through out the year at bingo and various activities). My mother was so excited and proud and I really wanted to do another one but this time I involved the ladies from the Assisted Living. I have an iron on transfer book (really out dated as far as pictures but it works). Kathy, the director of activities, told me to expect maybe 10 people. I made enough for 15 just in case. I had about eight show up and a few just sat there. I think this lady did a fabulous job on the bird house. This one lady was so sweet, she said she would give it a try but she couldn't see....I came home and tweeked it a bit. This flower pot my mother did. I really like this one, I don't know why but I do. This lady sat by me and was so sweet. I enjoyed talking to her and the other ladies. We did this yesterday, the auction is Tuesday so I came home and began constructing this quilt because who knows what tomorrow brings and I just gotta get ur done!! What amazes me, usually when I am rushed things happen, needles break, thread breaks, have to rip something out but things went smoothly......and I am surprised but happy surprised. So if any of you have any ideas of what activities that might be fun for these ladies, please comment. My mother is leaving assisted living and is going to reside in a small trailer next to our house but I still want to do something with these ladies. I look forward to berry season all year. First the dew berries and then comes the blackberries. A lot of the time it is too hot to pick the blackberries and by that time chiggers are out. I even emptied out all the berries from my freezer from last year (a few happy friends), getting ready for new ones. So this morning I decided to go and check on them. I could not believe they are ripe already!! My husband was getting ready to go somewhere and I asked if I had time to pick a few berries. Thinking that there would not be many. If I had my rubber boots on, I would still be out there picking. I don't feel like doing one single thing.! THE RESULTS OF MY CLEANING FRENZIE!!! I truly do not know what is going on with me.....I have been cleaning like crazy. Not only my sewing room but all the closets too. I sorted out my fabrics by color (which they originally were but through the years got messed up). I also sacked fabric that I was no longer interested in and hope to sell it or give it away. I am talking a huge garbage sack, the largest they make. Are you impressed yet? I had all my threads sitting on the book shelf but it just looked so tacky so I place them in the baskets by colors and made a home for my cricut. Then This little chest was a huge mess, not anymore!! When we moved in we just put things out of the way since the previous owners left us a mess. One place was the closet by the front door. Today was the day of reckoning. I am so happy. Wonder what I can clean tomorrow???? This is almost as good as sliced bread. My daugher in law sent me these clips which were given to her to give to me by her sister. Anyways...nothing like making a short story long. Have you seen these clips? I saw someone using them on their blog but can't tell you which one, sorry, or I would give you a shout out. See how small they are! I used them to put a border on a quilt and I tell you, I like them so much more than pins if I use them. My only problem is finding a container to put them in. They were sent to me in a ziplock baggie or I would be able to give you names etc.....sorry....all I can say is I like them. Counted 12 empty containers......now that is progress don't you think? See post below if you don't know what is going on. I am at a point where I can't stand it anymore. I wish some of you were here to take some of this junk (treasures) off my hands. My sewing room is getting a clean out, the only problem is, I CAN'T LET ANYTHING GO!!!! I need help desperately. The rest of this post is a diversion. I just love it. I was going to sell it but decided I liked it too much. See it hanging on the bench.....yep.....I get to see this beauty every day or at least for a while. I tried to find a picture of the table topper but gave up. So now that I have played a little, back to cleaning and sorting. Do I really need all of this stuff? 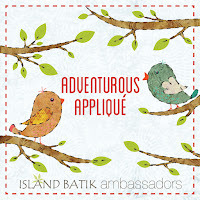 This month for Island Batik is as you see below Adventurous Applique. I am working on my project now. 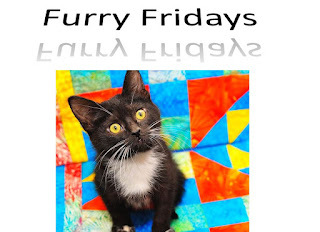 Here are the Furry Friday Blogs if you are interested in checking them out.